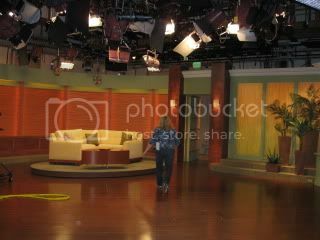 I have never been in any studio audience, but, I have to say this was so awesome and one of the best experiences ever! It is really different to see how the show is put together behind the scenes. Everyone on the set is so organized, funny and friendly. We lined up outside at 2:00 to wait. 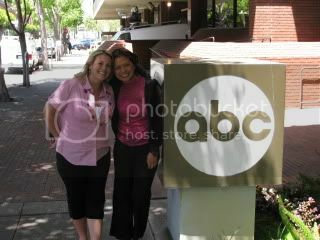 We couldn’t resist taking a pic next to the ABC Sign. One of the girls “Twittered” Hungry-Girl and she came outside to say hiya! So fun! Lisa, a.k.a., Hungry-Girl is so great, but, more on that later in her separate post. After waiting in line they escorted us upstairs and gave us one last chance to use the bathroom before we took our seats in the studio audience. Several of the guests who were appearing on the show along with Spencer & Janelle came out to greet us, say hi and answer our questions. 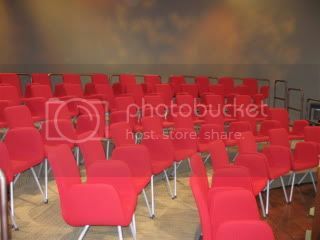 It was a nice quaint setting with only 25 people in the audience. We also got to practice our clapping and learned clapping quickly makes your clap louder. Throughout the show we were coached on when to clap or not. You are not allowed to take any pictures until after the show is done, but it is amazing how they do all their set changes in such a small area. These are two pictures of the studio where all the action happens. 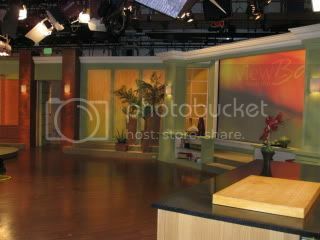 I have always wondered how they change the cooking segments so quickly, but, they simply have stands in the back ready to go that they roll in and out for each scene all on the commercial breaks. They do this all while chit chatting with the audience and cracking jokes with each other. It amazed me how they knew how they could talk up to the last 5 seconds before the show starts back up LIVE. Here are some fun links to check out all of the things we got to see on the show. You get to see us in the audience during the Hungry-Girl segment. She tossed Vitatops to us and I CAUGHT ONE!!! I was tempted to have her sign it at the book signing but The Husband was already teasing me about probably never eating it LOL. We are in the pink (Rachel & I while Jay is in his Blue Cal Shirt). 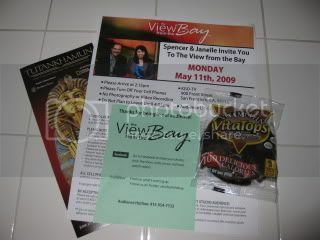 Here is my fabulous Vitatop prize! 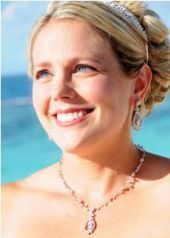 Jaqueline Paterson mixologist Hearts on Fire, Rio Tropical and other drinks with pizzazz! We’ll make delicious mocktails for summer! Ken Klemm and Peter Thieriot Buffalo Guys Buffalo Meat Loaf — an organic and low fat alternative to traditional beef. These guys were funny – total cowboys, but, I am not sure I would’ve been brave enough to try their super rare meat. Jan Brehm actress and creator of Menopause DVD An honest and funny look at menopause; Learn how to embrace (and get your husband to embrace) this change in life. Loved this Husband and Wife team. The Husband got a kick out of the video clip titled ESPM. Matt Skinner author of “Heard it Through the Grapevine: The Things You Should Know to Enjoy Wine” How to serve wine like a pro. Impress them, even if you barely know red from white! I LOVED the different shapes of his bottles and of course his accent! Tom Colicchio chef/author Real tips on how to save money and make the best meal every time, from one of America’s most popular chefs and authors. I actually didn’t really get to listen to this too much because they were talking in the studio and it was loud. Tom Musbach editor of HotJobs.com Who’s hiring in the Bay Area and where can you find extra income? We’ll find out where you need to look and what you need to know. Good tips! I absolutely LOVED, LOVED, LOVED the two Hosts Spencer & Janelle! They are so funny and their personalies really play off of each other. The best part is that they are THAT funny off screen too – what you see if what you get. I made sure to snap a quick pick with them as well to sum up our trip to ABC. The time that we were in studio really flew by fast and I’d totally do it again! They said they will be posting some pics on facebook this week of us. If they do, I will be sure to do an update and post those too. Next up, The Hungry-Girl Book Signing. Janetha ~ I highly recommend it! 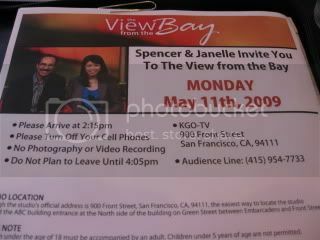 It was totally free to go on their show so if you are ever in Cali and near San Fran (visit your sis! ), you should check it out. It was such a fun experience.